The Detroit Free Press outlined Jimmy Henry's resume upon his promotion to AA in June 1992. Henry, still just 21, went 6-3 at high-A Lakeland that year, with a 1.09 ERA. He played the previous year largely at Niagara Falls and had a 2.22 ERA. The starting pitcher went on to see 15 starts at AA London that year, but he couldn't keep his ERA down. He ended up 5-5, with a 4.82 ERA. But, while he would return to London the next year, turning reliever, Henry never made it higher. He never made the majors. Henry's career began in 1990, having been taken by the Tigers in the 45th round of the previous year's draft out of Sacramento City College. He played his high school ball at Placer High in California. Henry played his first pro season at rookie Bristol in 1990. In 10 starts, he went 1-3, witj a 4.10 ERA. Henry then moved to short-season Niagara Falls and Lakeland for 1991. His Lakeland time comprised six relief outings and four earned runs over 11 innings of work. 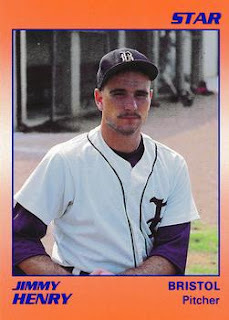 Henry played his time at Lakeland and London in 1992, ending with an 11-8 overall record between them and a 3.14 overall ERA. For 1993, Henry again split time between London and Lakeland. He played much of his time at London, getting into 33 games in relief. He turned in a 5.28 ERA, marking the end of his career.